I recently went on a wild edible plant walk here in the Boston area, and our guide told us that the best time to find mushrooms is between Labor Day and Columbus Day. We didn’t find any mushrooms on our walk, but he did get me thinking about making a recipe to show them off. I’m really interested in learning more about local wild, edible plants, so hopefully I’l be rooting around in the woods for some fungus soon. And if you made the black pepper and cumin pickled carrots from last week, here’s a recipe to try them with. 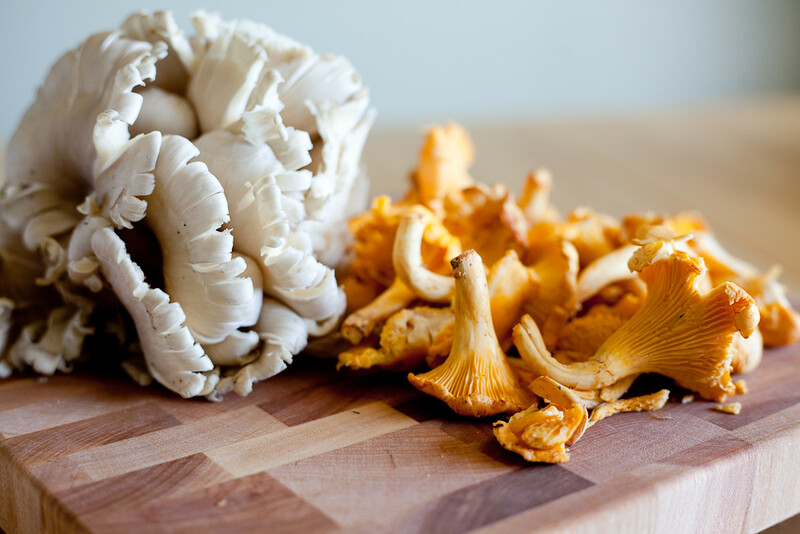 Any wild mushrooms will do for this recipe, but I picked out two of my favorites today: oyster mushrooms and chanterelles. Oyster mushrooms can be cultivated, so you are likely to find them outside of peak mushroom season. This also helps make them a bit more affordable than wild harvested mushrooms, but they are still many, many rungs up the ladder from the budget workhorse that is white button mushroom. If you are interested, there are many resources online that describe how you can grow oyster mushrooms yourself, at home. Chanterelles, however, do not cooperate with human cultivation. This means the mushrooms you see in the store were growing wild in a wood somewhere before they reached the shelves. The effort it takes to locate and collect them, their wonderfully complex flavor, and their perishable nature contribute to their price tag. 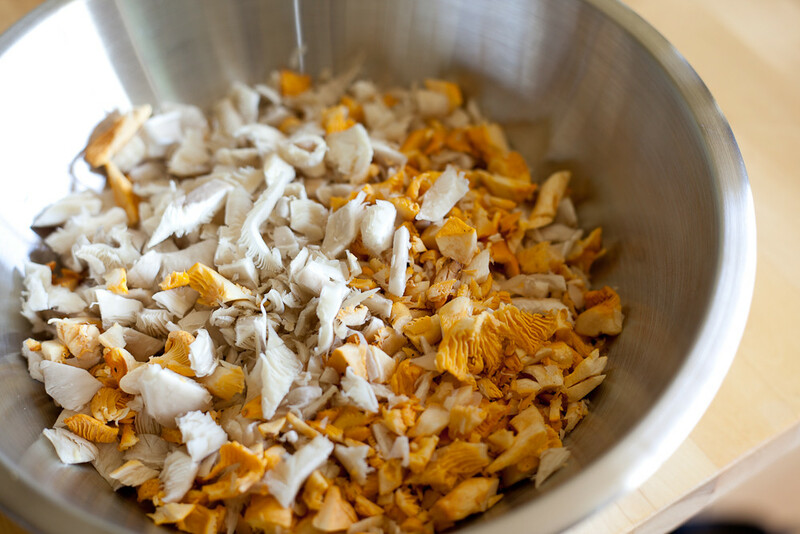 A note about using wild mushrooms: if you’re super squicky about eating a little dirt, this may not be the best food for you. Washing mushrooms makes them soggy and sad. I pick off anything that’s big enough to be picked off, and then chop it up and cook away without thinking too hard about what might be on them. As long as the mushrooms are not slimy, don’t have any overly soft spots, aren’t hiding bugs, and don’t smell off… they are declared clean in my kitchen. A little dirt from the middle of a forest won’t hurt you. And if you found your own, just be careful! Make sure you know what you have before you eat it. Arrange the racks in your oven so one is in the middle and one is in the highest position. Preheat oven to 400 degrees F.
Chop your mushrooms into a medium to small dice. Add them to a dry skillet over medium high heat. The mushrooms will begin to release moisture after a few minutes. After 3-4 minutes of cooking, add the salt, cumin and oregano. Keep an eye on the mushrooms and stir them every 10-15 seconds. Once most of the moisture has cooked out and they begin sticking to the bottom of the pan, about 7 minutes of total cooking time, add the Earth Balance and mix well. 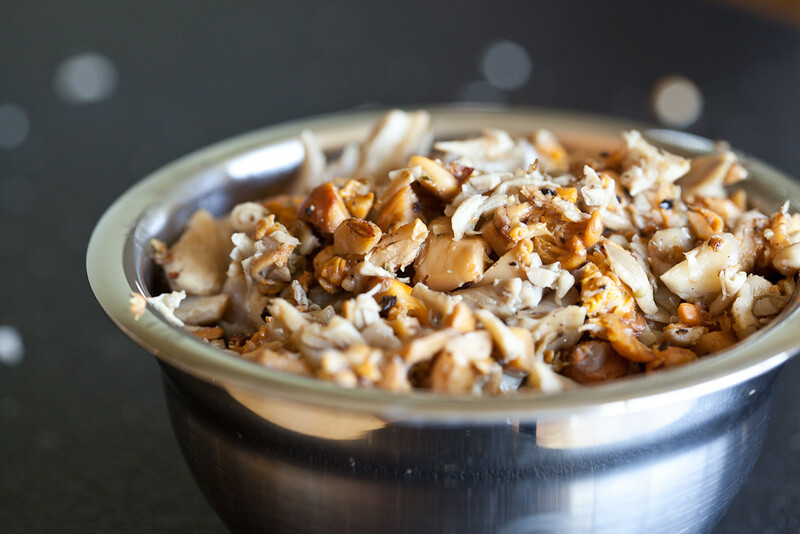 Remove mushrooms to a bowl and set aside. 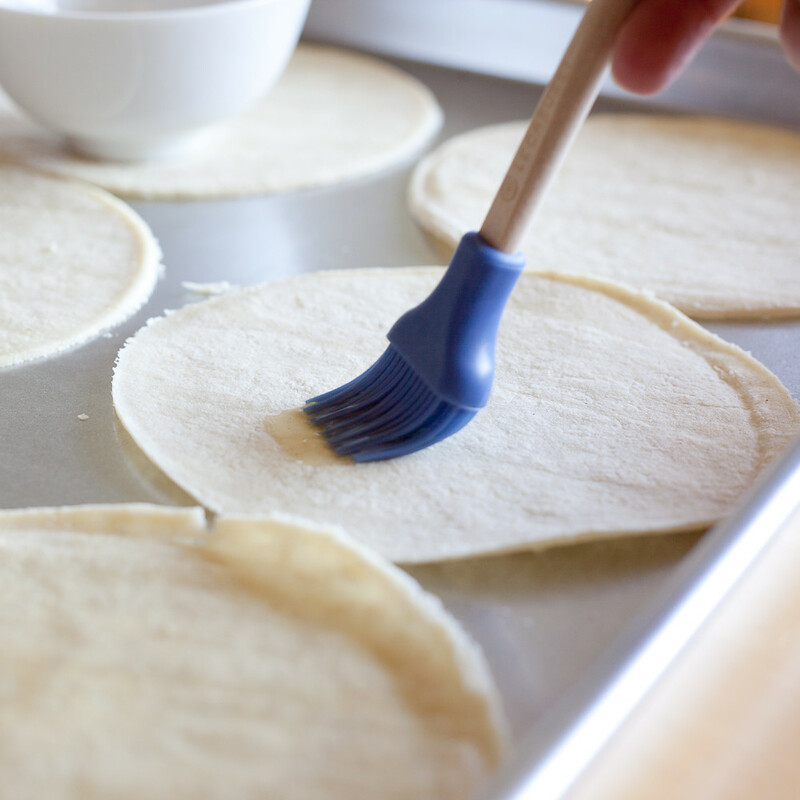 Place six corn tortillas on a baking sheet. Brush both sides very lightly with olive oil. Put tortillas in the middle rack of the oven and bake for approximately 8 minutes. The edges of the tortilla should be beginning to curl and they should only barely have the slightest hint of color. Remove from oven. 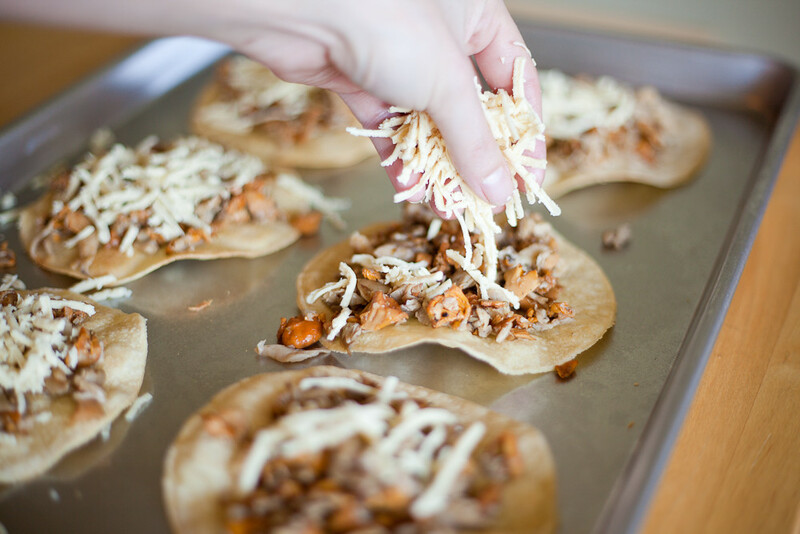 While the tortillas are baking, mix together the ingredients for the creme fraiche and refrigerate until ready to use. It will take a lot of whisking to get the mixture smooth, but it will happen if you keep at it! Once your tortillas are out of the oven, change the oven to the broil setting. 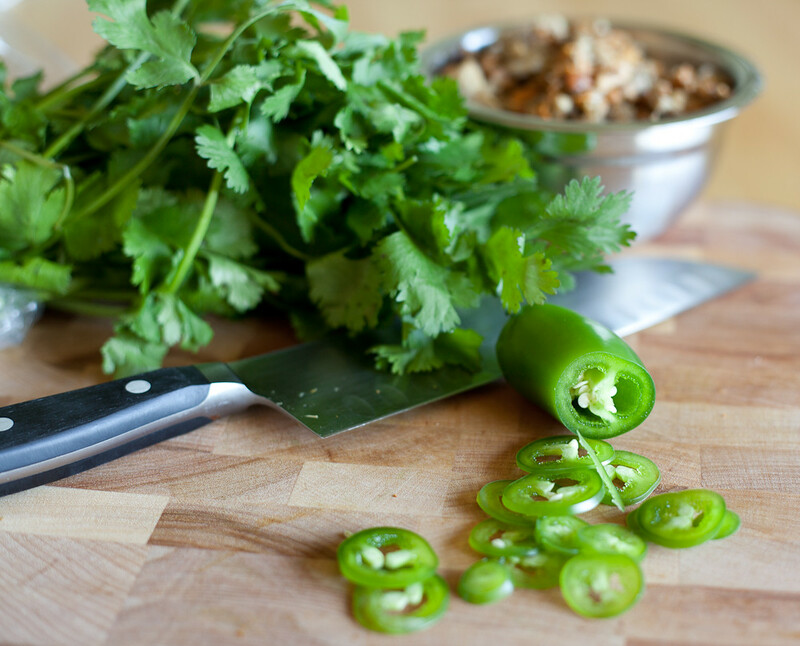 Get everything ready for assembly: sliced jalapenos, cilantro, carrot sticks, cheese, creme fraiche, mushrooms. 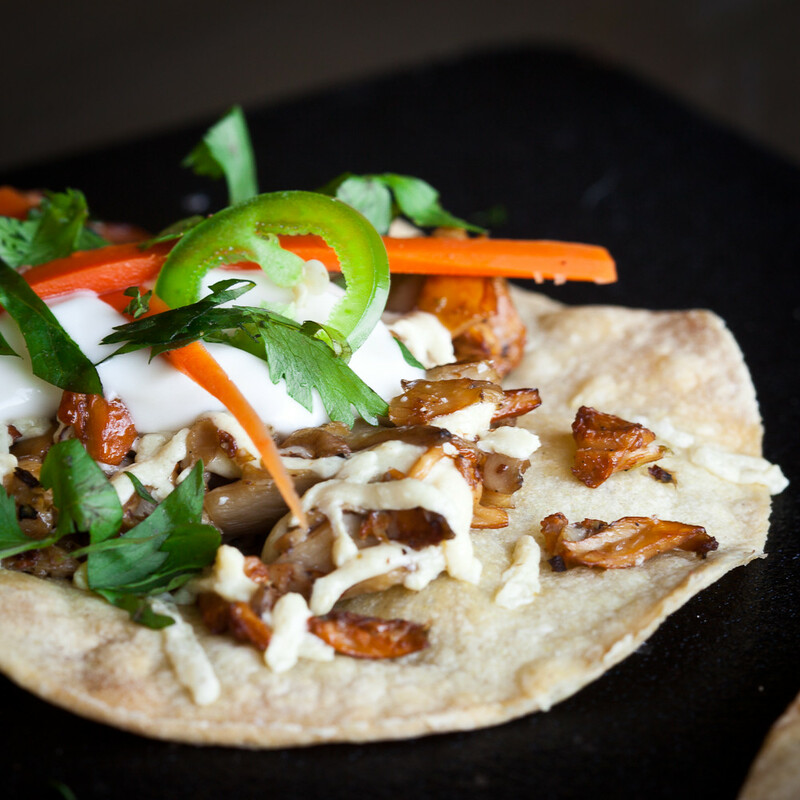 Evenly divide the mushroom mixture across the tortillas. Top with a little vegan cheese. Place in the oven, this time on the very top rack, to broil. DO NOT WALK AWAY! Watch them as they cook until the cheese is melted and the tortillas are golden brown. Remove immediately. 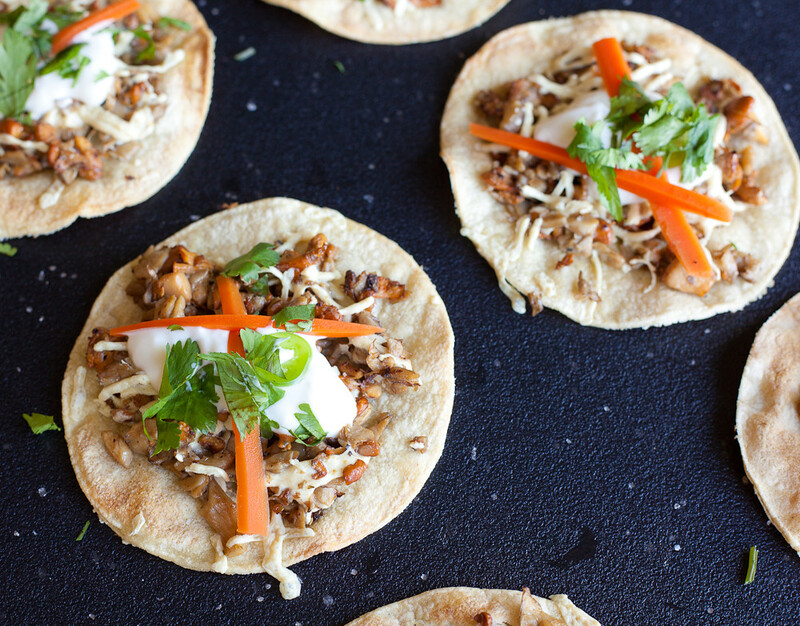 Top each tostada with a dollop of the lime creme fraiche, some cilantro, a slice or two of jalapeno, and two picked carrot sticks. Serve immediately. I like trying different recipes for mac & cheeze. I make my own version most often, but I’m always up for improving and changing my recipes when I can. Recently, I saw that VegNews had an interesting recipe. They use potatoes and carrots for the base (certainly healthier than my version) and cashews for the creaminess. I’m a huge fan of cashews to make sauces rich and creamy. So I made the recipe and was intrigued. The texture was AWESOME, the color was good, it was a little on the salty side… overall really nice. But it tasted a little too vegetable-y for my liking. 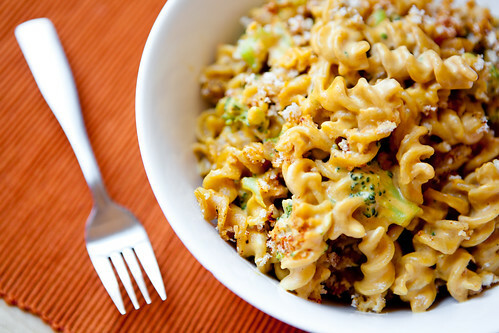 Now, vegan mac & cheese doesn’t really taste 100% like the non-vegan stuff. And that’s cool with me. 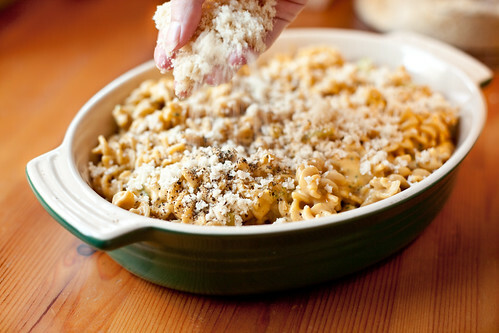 I just want it to taste good, and to satisfy a craving for a creamy baked pasta dish, you know? My other post has more of my thoughts on that. I decided to combine my recipe with with the VegNews recipe. I kept the potato and the carrots for the base, added some of my favorite flavorings, and left out some of theirs. For example, I took out the onion/garlic/shallots. 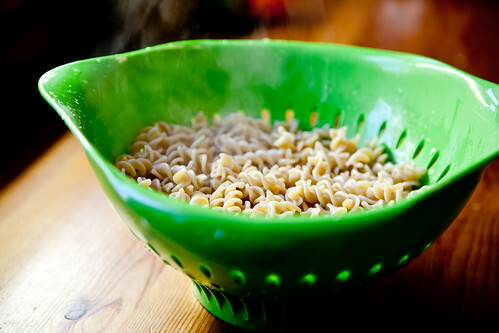 I’m not the biggest fan of those things to begin with, but I don’t ever remember having mac & cheese taste like onions. I know I just said it doesn’t have to taste the same, but those just aren’t the flavors I think of when I imagine mac & cheese, you know? Heat a large pot of salted water to a boil. Add pasta and cook until al dente. Drain and set aside. Meanwhile, steam broccoli and set aside. I use my rice cooker. Simply put the florets in the cooker with 2-3 Tbs of hot water and turn the cooker on. Broccoli will be bright green and tender-crisp when done. Don’t forget about it in there–it’ll finish cooking before the rice cooker clicks off, so if you forget about it, you’ll overcook your broccoli. Mine takes less than 10 minutes to cook. Make sure the carrots and potatoes are chopped very small; this will reduce the cooking time greatly. Place the chopped potatoes and carrots in small sauce pan that has a lid. Add the 1 cup of water. Boil covered until tender, 10-15 minutes. While the potatoes and carrots are cooking, add the remaining ingredients to the blender (cashew, miso, lemon juice, mustard, earth balance, nut. yeast, salt and pepper). Once potatoes and carrots are done cooking, add them and their cooking water to the blender as well. Blend until VERY smooth. If needed, add soymilk or water 1 Tbs at a time to thin. Taste for seasoning. Toast the bread and process into crumbs. 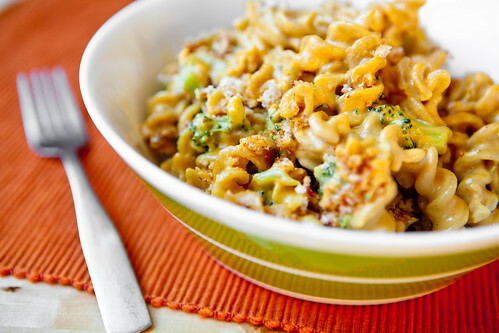 Toss the cooked pasta and broccoli with the sauce. 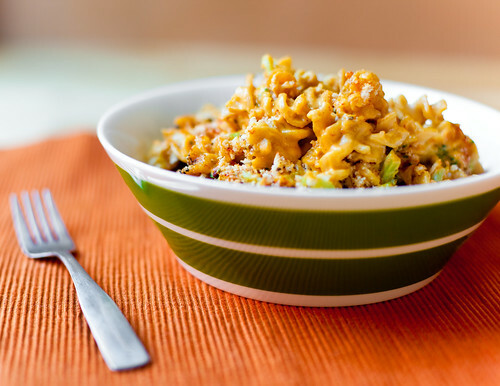 Place in a casserole dish and top with breadcrumbs, black pepper, and paprika. Bake for 25 minute at 350º F until browned and bubbly. Serve. I think I’ll make this version whenever I have potatoes handy. It’s a tiny bit lighter than my other version, but it still has a lot of flavor and creaminess. And it saves on soymilk, too!